Guernica’s first flip book and dual translation, A Hunger Artist and Other Stories; Poems and Songs of Love, has been garnering media attention for exploring the relationship between Kafka and Langer, and to offer English readers a first glimpse into the poetry of Kafka’s long lost friend and contemporary. Keith Garebian is the latest reviewer to write about the book and offers his take on the dual translation. Garebian mentions the complications associated with translating the text from its original Hebrew: “In their close collaboration, the Wolffs wrestled with the question of how to render ‘an idiom, colour a word, or untangle a syntactical ambiguity in order to correctly and effectively convey meaning and evoke the elusive quality of tone in moving from Langer’s Hebrew to English.’” Certain end-rhymes simply did not have English equivalents, which made translating Langer’s poems that much harder for the duo. The Wolffs were also confronted with the problem that English does not mark gender to the degree that Hebrew does. “You, “friend,” “companion,” and “lover” are gender neutral in English, but not Hebrew. As such, the Wolffs had to improvise and use alliteration and assonance to replicate end-rhymes. Garebian acknowledges that the “Note on Translation” greatly added to his understanding and appreciation of the poems, as well as the history behind them. 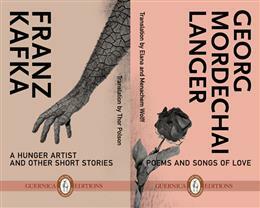 A Hunger Artist and Other Stories; Poems and Songs of Love includes the work of both Franz Kafka and Georg Mordechai Langer. Franz Kafka’s writings are characterized by an extreme sensitivity manifested in absurdity, alienation, and gallows humor. The collections of short pieces, A Country Doctor (1919) and A Hunger Artist (1924), newly translated by Thor Polson, represent later works in the corpus. Poems and Songs of Love is a translation of the collection Piyyutim ve-Shirei Yedidot by Georg Mordechai Langer. Published in Prague in 1929, it contains an elegy to Langer’s friend and mentor Franz Kafka, and other openly homo-romantic poems. This collaborative translation by Elana and Menachem Wolff brings the fascinating work of Langer—poems as well as an essay on Kafka—to the English-reading public for the first time, and sheds light on a hitherto unexamined relationship. Tagged with A Hunger Artist and Other Stories; Poems and Songs of Love, Elana Wolff, Franz Kafka, Georg Langer, Hebrew, Keith Garebian, Menachem Wolff, Poetry, Thor Polson, translation.